The large and small tunable Nagado are the first of their kind. 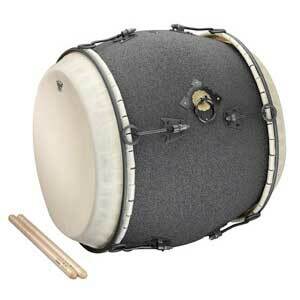 They feature a heavy duty tuning system, steel counterhoops, and replaceable drumheads. Pitch flexibility combined with heads that can be changed in minutes instead of days make the tunable drums both practical and inspiring. Remo also offers a large Nagado in a pretuned version with tacked heads.Remoï¾’s Nagado are the perfect examples of tradition inspiring innovation. An Acousticonï¾™ shell, durable TUFF-E-NUFFï¾® finish, and Remoï¾’sType 12 NUSKYNï¾® Taiko heads have made these drums a powerful new choice for professionals, educators, and students. The large and small tunable Nagados are the first of their kind. They feature a heavy duty tuning system, steel counterhoops, and replaceable drumheads. Pitch flexibility combined with heads that can be changed in minutes instead of days make these drums both practical and inspiring. History: Because they were the only instruments that could be heard across the entire battlefield, Nagado were used in battle to issue commands and coordinate movements in 16th century Japan. Currently the Nagado is used widely in shrines and temples, traditional festivals, and in concerts of ensemble music. They are often featured as the main instrument in Taiko performances.